It’s a brave new world for General Electric on Day 2 outside the Dow. After getting beaten up and kicked out of the blue-chip index, its shares are now rallying to their best level in a month. Step in with caution here, says one technical analyst. GE is up close to 4 percent on Wednesday a day after a nearly 8 percent surge. Its stock had rallied on Tuesday, its first day out of the Dow, after CEO John Flannery announced a spinoff of its health-care business and an exit of its Baker Hughes stake. 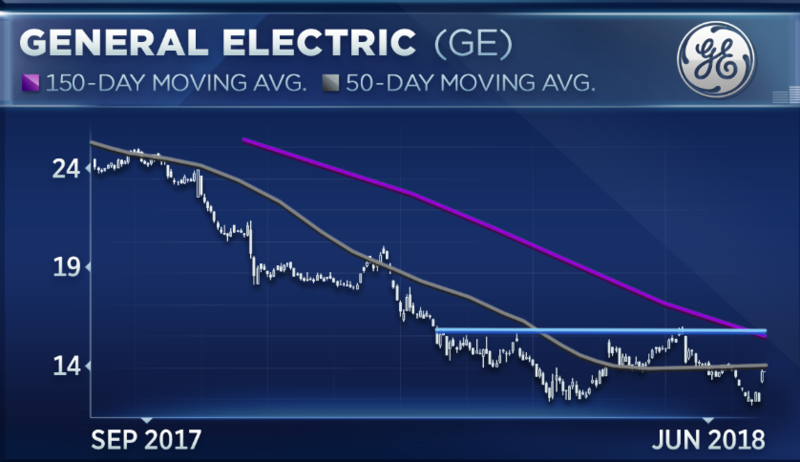 Before this two-day rally, GE shares had plummeted to their worst levels since the financial crisis nearly a decade ago. It remains roughly half of where it traded a year ago. Long-time GE investor and Susquehanna market strategist Stacey Gilbert says GE’s restructuring efforts are steps in the right direction but just the beginning. To hedge against potential volatility during GE’s turnaround, Gilbert suggests taking advantage of the protection offered by options. GE shares are down 18 percent this year and 48 percent over the past 12 months. The S&P 500’s industrials sector, which houses GE, has dropped 4 percent in 2018.